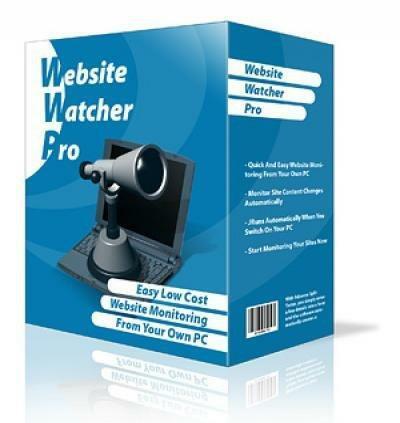 WebSite-Watcher - a powerful software to monitor the sites for their updates. When changes are detected and updated pages are stored on them highlighted in all the changes. For more specific control over changes of certain information might well use custom filters. The program supports integration with most popular browsers - Internet Explorer, Firefox, Netscape and Opera. Work with Website-Watcher starts by creating a database of links. All the information about links program are stored in files, which can be several. The presence of several bases options can be useful, for example, if the computer has several users, or if you want to share their Bookmark categories. Add new links in two ways - manually or importing them from your browser. Website-Watcher works with the major popular browsers, including Internet Explorer, Netscape, Opera, NetCaptor and NeoPlanet. Import links from your browser you can one by one, dragging them into the selected folder, or all at once. It Bookmark not get mixed up, but will be stored in the same folder in which they are stored in the "Favorites" browser. In parallel, all references will be placed in a folder All Bookmarks. If you use a proxy with the Internet, before you start checking references, you must specify the hostname and port of the proxy settings Website-Watcher. Manual do not necessarily - the program can use data from Internet Explorer. To export just one click Use Settings from Internet Explorer. Monitor web pages with a minimum of time. Why waste hours surfing the web, when WebSite-Watcher can do this job for you within a few minutes. Supports all kind of pages with textual content (html, asp, php, ...). Logins to a password protected page can be recorded with the integrated Check-Macro feature. These macros are executed when WebSite-Watcher checks the bookmarks for updates. Efficient way to monitor forums for new topics and replies using forum templates. Works with all major forums including phpBB, SMF, vBulletin, IPB, etc. Website-Watcher converts RSS/Atom feeds into a readable format using a template system. So you can use the full power of WebSite-Watcher to detect new or changed RSS postings within a single tool and also monitor password protected RSS feeds behind a login. WebSite-Watcher offers a base functionality for reading and writing new newsgroup postings and answers. The newsgroups functionality can also be used with the keywords functionality to monitor postings for specified keywords. WebSite-Watcher automatically converts PDF/Word/Excel documents into HTML files, so you can check them like normal web pages and also search for specified keywords. Binary files (for example zip or exe files) can be monitored via the file date, the file size or via a small part of the content. That allows you to efficiently monitor large files without having to them. Dependent from the server, WebSite-Watcher will choose the best checking method automatically. Monitor local files and directories and use the same powerful features as you do for web resources. * Many more features to stay up-to-date! WebSite-Watcher 2013 13.0 Final Business Edition Fast Download via Rapidshare Hotfile Fileserve Filesonic Megaupload, WebSite-Watcher 2013 13.0 Final Business Edition Torrents and Emule Download or anything related.